The eternal struggle between two competitors in the genre of football simulator - Pro Evolution Soccer and FIFA - continues. As you know, FIFA 14 game was launched for all platforms (including the next-gen consoles), while PES 2014, unfortunately, was released only for the current generation of consoles and PC. Naturally, the fans of the franchise are still wondering whether the latest released version of PES will be ported on Xbox One and PS4 or not. 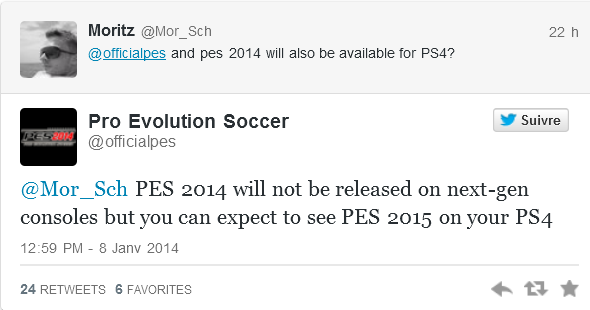 We have not only the answer to this question, but also an information about PES 2015. Thus, according to a message left by developers (as the response to the question) on the official game’s page in Twitter, PES 2014, unfortunately, won’t be ported to the next-gen consoles, however desperately the game’s fans wanted it. But the next instalment of this popular simulator will appear at least for PlayStation 4. As for PES 2015 version for Xbox One, there isn’t any information about it for now, but we can assume that the developers will not pass over the owners of the new Microsoft’s console. What do you think about it? Would you buy the game’s version for PS4? Your comments are always welcomed at the bottom of the page.